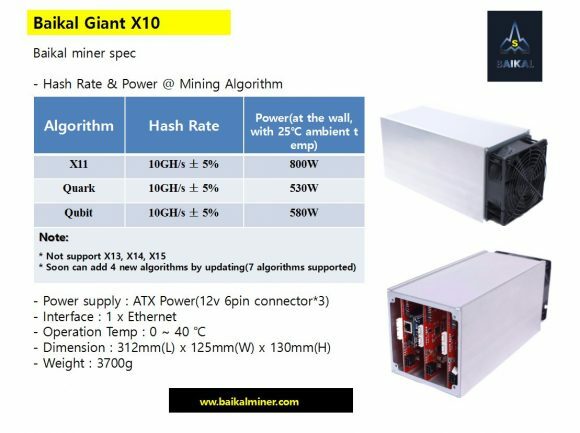 It seems that BaikalMiner also wants to join in the recent wave of new and much faster second generation X11 ASIC miners with their Baikal Giant X10 that was just announced on their twitter account (still not on the official website). The device is supposedly going to offer 10 GHS hashrate for X11 (DASH) at 800W of power usage as well as Quark and Qubit algorithms initially with lower power usage. Support for X13, X14 and X15 is not available on this device, but there is a mention of a future update that will add 4 new algorithms. The miner will supposedly be available at a price of $1188 USD with deliveries starting by the end of October. It is certainly not the fastest, but pricing does seem pretty reasonable for what you get in terms of hashrate and the extra flexibility in the form of support for additional algorithms is interesting and still unique compared to other X11 only ASIC miners.